A responsive performance sailing glove designed for active line handling in all conditions. 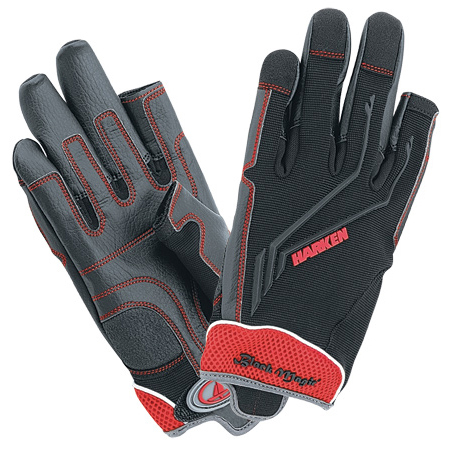 Full-finger Sticky, abrasion-resistant Black Magic palm and finger wraps provide superior grip, while maintaining dexterity and freedom of movement. Stretch-woven material and molded-rubber guard strips across the back provide lightweight protection. To get your glove size: Measure your hand at its greatest width; start in between your thumb and index finger, run the measuring tape straight across your knuckels, around your hand, and finish at the starting pt. Then convert the inches to the glove size using the chart below. Size Chart Junior : 6.5"-7" Adult XS: 7"-7.5" Adult S: 7.5"-8" Adult M: 8"-9" Adult L: 9"-9.5" Adult XL: 9.5"-10" Adult XXL: 10"-11"